You see, I’m a keen sailor, kayaker and gig rower and take great comfort from knowing that our lifeboat crews are there should I ever need them. And my late father worked for the Royal National Lifeboat Institution* (RNLI) for many years. So the charity’s activities formed a big part of my childhood. Sitting on the beach watching lifeboats out on exercise. Sneaking an occasional ride on a D-class inflatable or an Atlantic 21. Answering the phone late at night to gruff voices in faraway coastal locations. And now it’s my turn to help. So with the support of my wife, Natalie, and Molly, my Labrador dog, my band of intrepid LEGO minifigures and I will be learning more about the lifeboat service, its brave volunteers and the vital work that they do – day and night – to keep us safe. I’ll also share some of the tall and not-so-tall tales from the lifeboat service of my youth, which I hope will make people smile to read them as much as I smile from remembering them. The Crew: [L-R] Mechanic Dave, Coxswain Bob, Crew Member (and doctor) Jackie, Crew Member Steve, Crew Member (and ace helmsperson) Susie and Deputy Coxswain Anna. 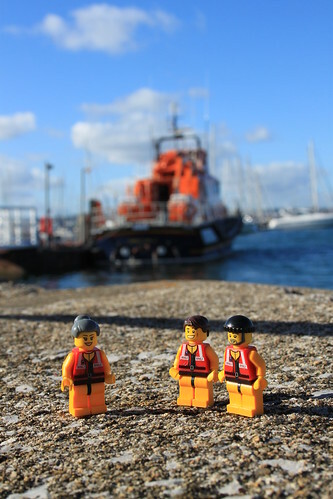 We’ll be keeping readers up to date on our website, with stories and photos from our travels around the coast as well as important water safety messages (but mini-fig style!). I’ll try to remember to re-blog things here, too. Probably about once a week, if I manage to keep my act together. We’ll also be posting regular photos and updates on Twitter and on Facebook. * In case you’re not familiar with the RNLI, it’s the charity that saves lives at sea. Its volunteer lifeboat crews rescue an average of 23 people every day and RNLI lifeguards provide a seasonal lifeguard service on many of our most popular beaches. The RNLI is independent from Government and relies on support from people like us. This entry was posted in Outdoors, Photography, Travel and tagged Coast, Lifeboats, Photography, RNLI by Simon Perks. Bookmark the permalink.